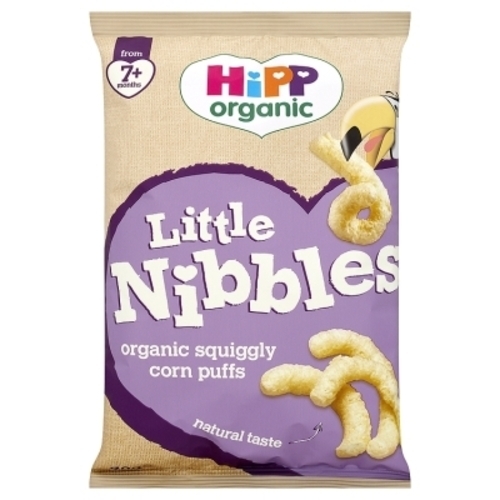 The new melt-in-the-mouth Squiggly Corn Puffs are HiPP’s latest first finger food for babies from 7 months upwards, specially developed to encourage them to chew and feed themselves. If that wasn’t enough, the newly inspired Squiggly variety is entirely free from all nasties with a purely natural taste. So as is always the case with HiPP, you can rest assured that you are feeding your little one the very best of organic. The all natural Fruit Bars with Cereal have also joined the HiPP Organic Little Nibbles snack range, available in two different varieties; ‘Plum & Apple’ and ‘Peach & Apple’. They are both sure to tantalise your little one’s taste buds! With no added sugar, each fruit bar contains 50% organic fruit and four different organic cereals, suitable from 12 months onwards. These handy sized bars are also sold individually, making them the ideal snack when out-and-about! For those Elephant Biscuit lovers out there, you’ll be pleased to know that HiPP have tweaked their existing recipe to make them even tastier! Not only are they now free from added sugar, but they have also introduced organic apple juice for a sweeter flavour. These distinctive elephant shaped biscuits are perfectly sized for little hands to hold onto, providing important top up nourishment for tiny tummies, as a convenient snack. Suitable from 12 months onwards. Other scrumptious products which sit within the new HiPP Organic Little Nibbles range include the yummy range of Little Nibbles Rice Cakes which are available in 3 delicious flavours; ‘Organic Apple’, ‘Organic Carrot and Pumpkin’ and ‘Organic Tomato and Sweet Red Pepper’. All are made with just organic rice and fruit or vegetable juices so are naturally free from added salt or sugar. This press release was distributed by ResponseSource Press Release Wire on behalf of HiPP Organic in the following categories: Children & Teenagers, Health, Women's Interest & Beauty, Environment & Nature, Food & Drink, for more information visit https://pressreleasewire.responsesource.com/about.